A Delight for Hands and Body! 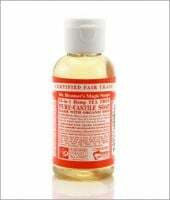 Dr. Bronner's soaps are amazing. "Peppermint" gives me a wonderful tingle. I love the fresh scent of "Tea Tree." It is capable of getting rid of the toughest dirt, grime, you name it, and it always leaves skin soft and supple. "Lavender" is next on my list! My grandmother used to swear by this soap, and she always had beautiful hair and skin. I was glad to see that I could find it at such a reasonable price, and that I could recognize what the ingredients in it are. The scent was very nice and fresh; I am a huge fan of the tea tree oil. The soap had a good slip to it, and the lather was very light, not foamy at all. However, I found this soap to be s...read moretripping and drying. It was very harsh to my dry hair, and I would not recommend it to anyone with dry or damaged hair. I will probably just end up using this as a hand soap instead. If you have members of the family with skin issues, this castille soap shouldn't cause reactions. My daughter gets hives if I use typical store-brand laundry detergent and insect repellent and I have reactionary skin. We use the lavender soap for laundry and repellent and peppermint for other cleaning jobs. I keep a spray bottle with each in the garage. The key is figuring out the correct soap-water ratio and it's always surprising how much water you use. It lasts and lasts.